I could just stare at this picture all day. 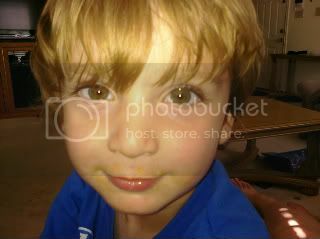 This was taken a couple of weeks ago, when Zane was sick, but not acting sick. In fact, he had just polished off two helpings of mac and cheese. He was asking about his Daddy, who was at work, so I took a couple of pictures with my cell phone and sent them to Larry. But this one beatific smile just stayed with me. It's now on my phone, and I look at it at least once every hour, sometimes more. Looking at that face is a definite stress reliever. I have to wonder, however, if I am the only mother who could look at pictures of my child all day long. I think I could look at it all day long, too. I want to smooch those cheeks!!!!! Precious picture, I don't blame you!